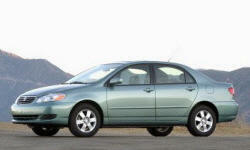 Toyota Corolla Fuel Economy Pros and Cons | Page 1 of 3 | Why Not This Car? Fuel economy is impressive though you pay a small price in power. Great fuel economy. Have never measured it, but it is sooo much better than our previous minivan. Excellent fuel economy.......generally below 7.5 l/100kms....with really good trips in the 5 l/100km range. Fuel consumption varies with tires however. Very good on fuel and I can stretch a tank of gas over a long period of time. 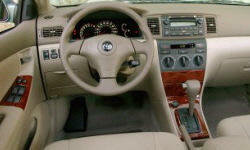 Its superb, the highest fuel economy avaible in its category. Excellent, about 30 MPG estimated. According to EPA, it can get up to 40 mpg. On our first calculation, we did about 32.8 mpg in mixed highway/city driving. Exactly what I was looking for. Consistently get 28-30 mpg in mix city and highway (50/50) driving. Great fuel economy, average about 35 to 37 miles per gallon in winter and about 33-34 in summer with A/C use. At the time of driving it, it led the pack. 37 mpg and its not even a hybrid, enough said. Great Highway and city mileage, on the Highway I can get 35+ miles per gallon. Best car I have ever owned for fuel economy. I routinely average over 40 mpg. Highest was 48.9 mpg. I buy 89 octane fuel which delivers an added 10% mpg over regular 87 octane. BYW, Ethanol blends lower my mpg by 10% too. With the 5 speed manual, my car has never gotten below 34 mpg. It averages 38 mpg, and has gotten 42 mpg on the highway.